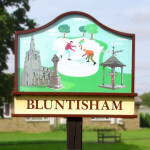 Bluntisham Parish Council are holding another Christmas Craft Fair in the village hall. If anyone is interested in having a stall at this event please contact the clerk. Tables are priced at £10 for a large one or £8 for a small one. Father Christmas and a local Photographer will also be at the event. The event is to raise money for improvements to the village and we look forward to your support.